Villas in Greece and the Greek islands. Vacation and accommodation in Greece is a complete Travel Guide for the Greek islands and Greece. In Vacation-Greece you will find a list of hotels in Greece, studios, apartments and villas for all budgets. Find hotel offers in Greece, see maps and photos of Greece, book flights, ferry tickets, discover Cyclades, explore Greece, book guided tours, ancient theatre and museum tickets (delivered to your home address) and make hotel reservations. Enjoy a holiday in absolute privacy offering all amenities. Wonderful villas, traditional cottages, beachfront properties and sea-view apartments are only some of the options you will find. All villas are self catering (they include fully equipped kitchen) and offer cleaning usually once or twice per week. They can accommodate from 2 to 16 people and can be rented as a whole or by bedrooms. Only some of the villas in Greece offer amenities for people with mobility problems, so please check out of they have special access to the villa and if the villa has been specially designed for this. Villas with swimming pool can accommodate families with young children, however, parents must be extra careful not to leave their children unattended near the pool area as in most cases there will be no lifeguard. Staying in a villa may initially seem quite expensive, but think of all the extra costs you will be saving if instead of having to go out for a meal or even a snack, you can prepare it at a minimum cost. Holidays in a villa are definitely relaxing as you will feel at home from the very first day. 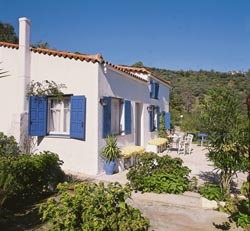 Vacation-Greece.com gives you a great variety of holiday homes starting from cheap country cottages to luxury estates. Select among our wonderful villas in Skopelos, excellent holiday homes in Ithaca, unique beachfront properties in Corfu and many other Greek destinations. Surf our travel guide and contact us for more information.